5793 labyrinths found. Showing 701-720. Sorted by country, state, city, then zip/postal code. Available to facilitate labyrinth walks at your venue, by arrangement. Summer: 7.00am - 7.00pm daily. Mount Ephraim Gardens is approx. 1 mile from the end of the M2 motorway, and is situated between the villages of Boughton and Hernhill. Follow the brown & white tourist signs from the A2 or A299. Open 1pm to 5pm, Wednesday, Thursday, Saturday & Sunday, from Easter until the end of September. Check the website for precise details, special openings and events. Based on the design of the St Catherine's Hill Mizmaze at Winchester, but circular rather than square, with a few breaks in the path to extend the enjoyment (or frustration!) of the walk. Huge three-dimensional labyrinth pathway encircling Glastonbury Tor, a natural hill overlooking the town of Glastonbury. Built by different members of the Glastonbury community to celebrate our Tercentennial - the 300th year since Queen Anne gave us our town charter in 1605. It celebrates four saints important to Glastonbury - Bridget, Mary, Dunstan and Joseph of Arimathea. 10:00 to 16:00 most days. St. John’s Church Office phone number: +44 1458 830060 for details. It is in the St. John's churchyard, but the gates are open every day for all to walk and enjoy. Information pamphlets are available near the mouth of the labyrinth. Dedicated to Archangel Uriel's heavenly flame of transformation. 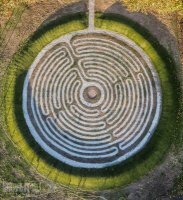 By road: The Talliston Labyrinth is located 9 miles from Bishops Stortford, 4 miles from the M11 and 1 mile northwest from the A120. By train: An hour from London Liverpool Street to Bishops Stortford, then 15 minutes by taxi. By air: 7 miles from London Stansted and 35 miles from London City airports. From the car park at Walltown, head north through the gate and walk for about 200 yards. You will come across the Peace Labyrinth on the right hand side of the path opposite the pond. This labyrinth is based on the classical seven path Cretan design. It is made up of over twenty varieties of coloured willow. Over a thousand willow trees have been planted in this labyrinth. 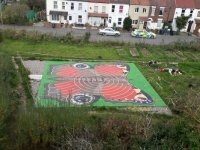 The Seeds of Hope Children's Garden is situated at the east end of the Cathedral and incorporates 4 separate areas, one for each season, together with a bronze sculpture of 2 life-sized children and a labyrinth. With the help of an Activity & Information Pack, children are encouraged to learn about change from the ever-present cycle of life in the Garden. 51 deg, 14' 27.° Lat. ; 0 deg. 35' 20.4° Long. The labyrinth is carved on a memorial cross, dedicated to the 4th Viscount Hood, in a small enclosure in the churchyard, behind the church. Small labyrinth in front garden of "Conifers"
Situated in Old Mede meadow, behind the farmhouse, just beyond Spider's Wood. Visit our website for details of visiting, events and open days. 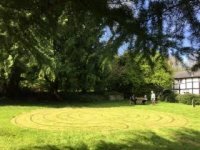 The labyrinth is open from 1st June to 31st August at all times and other times by appointment - telephone 01394 382992 for details. 52 07 09.2 N° Lat. ; 1 16 54.8 E° Long. 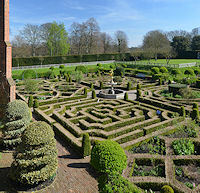 Situated in the Old Palace Garden, a recreated Tudor garden featuring a simple boxwood maze based on 16th century designs. The Old Palace Gardens are usually open Tuesday through Sunday, 10.00 to 5.30, but check the website for winter hours and any special events that may affect opening hours. Please note, the maze cannot be walked. 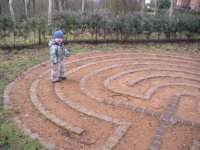 My portable Chartres labyrinth is available for rent @ £75 a time. Please contact me by email or Tim Gibbons on 01422 842851. 10 x 10 metres, 34 x 34 feet approx. This labyrinth is to be found on the Bishop's Meadow in Hereford UK, on the opposite side of the river from the Castle and the Cathedral. This labyrinth is a copy of a drawing of a labyrinth to be found on the medieval Mappa Mundi at Hereford Cathedral.